As member of the Othodox Presbyterian Church denomination, Bethel Reformed is a Presbyterian church. Presbyterian churches are governed on the local level by “sessions”, a group of men that have been set apart by the local and regional bodies of the church. Our session is made up of our pastor, Andrew Miller, and several laymen from the congregation, called “ruling elders”. Bethel also has deacons who serve to facilitate mercy ministry. All of our church officers love God’s Word and have made themselves accountable to a regional association of churches called the presbytery. We are part of the Presbytery of the Mid-Atlantic. All of our church officers believe that the Westminster Confession of Faith and its Larger and Shorter Catechisms faithfully summarize the teachings of Scripture. 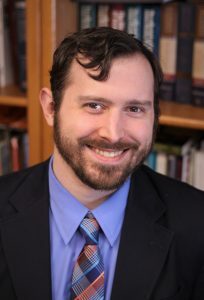 Andrew Miller earned his Master of Divinity from Westminster Seminary California. He has served as pastor at Bethel since 2014. He and his wife, Rebekah, have 4 children.